Giving a voice to the autistic community. Autistic Wiki is a free library of information about autism. It is written and monitored by the autistic community. We are the real autism experts. This is where autism really speaks. Good news! 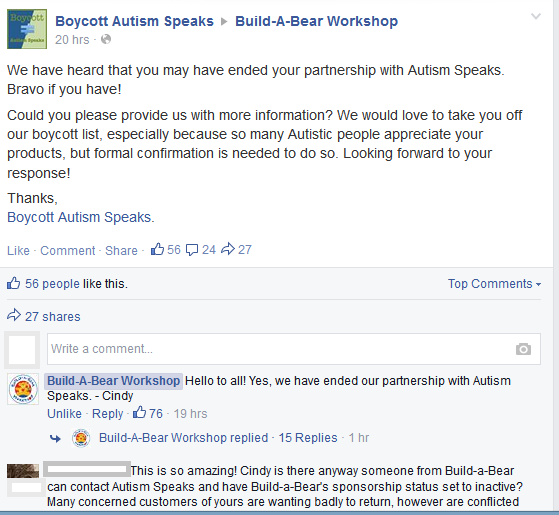 Boycott Autism Speaks reports that Build-a-Bear Workshop has ended their partnership with Autism Speaks. To celebrate and show my support I went and made a purchase on their website. I purchased a little pink octopus for my cat. She likes pink. Please contact Build-a-Bear on Facebook or Twitter to say thanks and consider making a purchase to show your support. And ask your friends to do the same. Thanks to Build-A-Bear for doing the right thing and to Boycott Autism Speaks for all of your hard work!